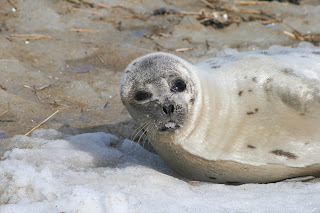 The above picture is an adult harp seal (in Kingston last week). Adam talked a lot about this species in his post here. As he mentioned, they are named for the so called harp shape on their back. The adults are pretty distinct with this harp or wishbone pattern and black face. A staff member at NEAQ used to say they dipped their face in chocolate, so that's how I like to think of it now. Also notice the dog like shape to the snout, like a labrador retriever's head. Noting the shape of the head will be a handy tool as we identify the other species. The above photo is a juvenile harp seal that was in Weymouth a few days ago. Notice the very different coat pattern the juveniles have compared to the adults. They have a tan coat, which is usually darker on the back, and spots of black. 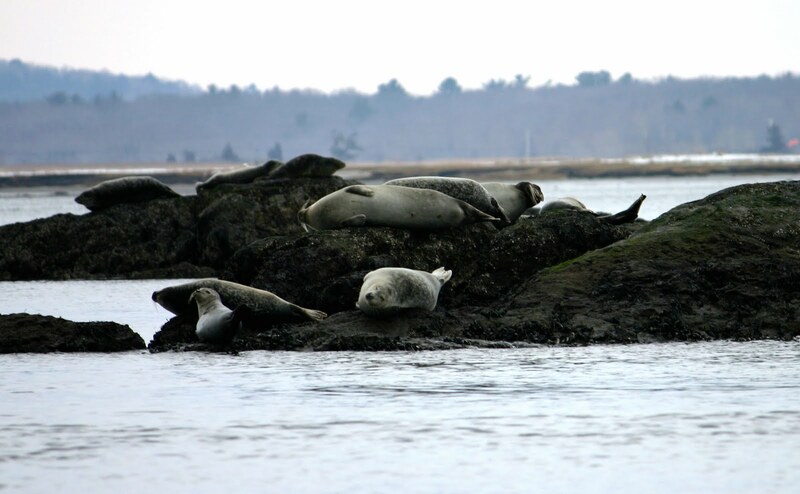 I like to think of them as having blobs of ink dropped on their coat, instead of the mottled appearance of harbor seals or the blotchy spots of gray seals. It's not unusual to see harp seals eating ice or snow, like this juvenile harp was doing. Notice that nice mouthful he has? We're not completely sure why they do this, but the possibilities include they are hydrating themselves or it is a stress response. And now for the other ice seal in the area...hooded seals! 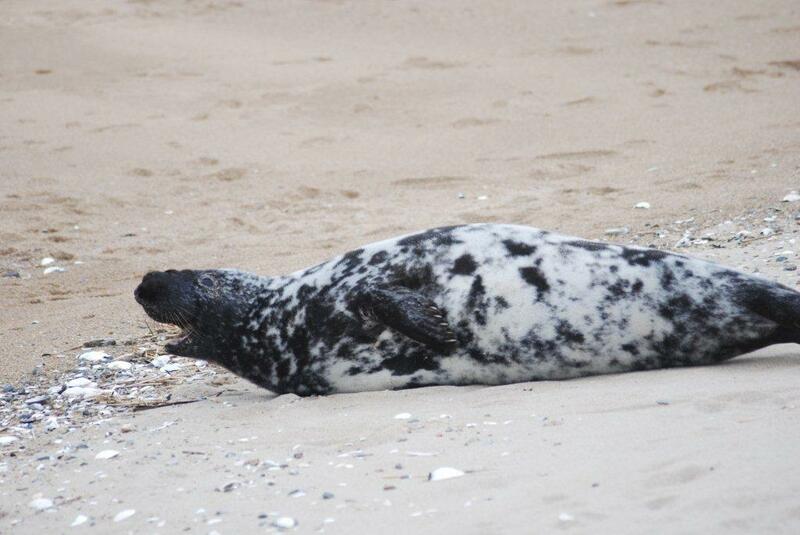 The below photos are of a subadult male hooded seal in Salisbury last week. We don't see these seals at this age very often down this way so it was an exciting sight. The above photos show the "hood" or enlarged nose of the males. This is how the species gets its name. This "hood" can be inflated to make the head appear larger, and the nasal membrane can be inflated to form a red, balloon-like appearance during times of aggression or mating. Their coat is silver with black splotches. The adult females usually have less splotches and do not have the "hood." We also see yearling hooded seals occasionally as well, like the one in the above photo (from 2009). We refer to them as blue-backs, because of the bluish silver color on their back and face. 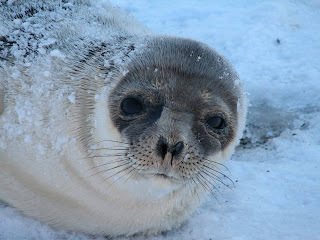 These seals also have dog like shaped faces, but I refer to it as pug like since it has a much shorter and flatter snout. They also have very large eyes spread far apart on their face. 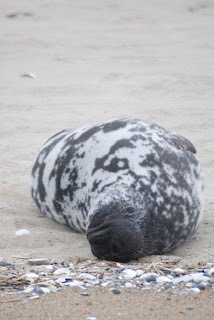 The above photo is a gray seal pup from Nantucket a few weeks ago. Pupping season for gray seals is coming to an end at this time of year. They are born with a lanugo, or white fur, which they shed after two to four weeks. The seal above still has the lanugo on his face and flippers. Also notice the longer and larger head, which can be described as a more horse-like shape. 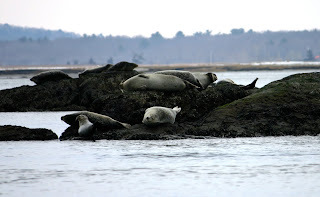 And of course the harbor seals are still hanging around. The above photo was taken by Terry Rogers, a NEAQ field volunteer, a couple weeks ago in Salisbury. They have a great haul out area up there! I hope this brief seal guide is helpful when you are out on the beaches. 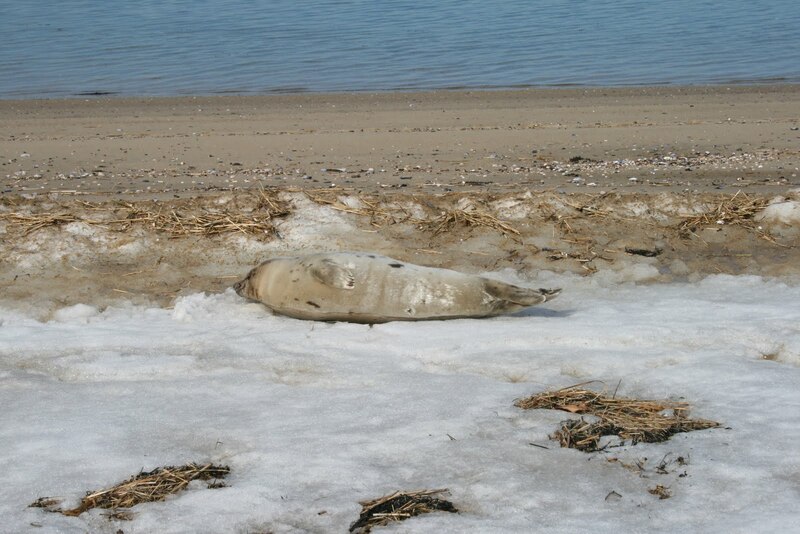 Don't forget to call our stranding hotline, 617-973-5247, if you see a seal on the beach! Does the hooded seal lose it's spotted appearance when it matures? I See Harps... They're Everywhere!